Greetings and my best to all my friends and readers for a great 2019!! It’s been a very fulfilling and fun year writing my blog. As well as providing an admitted excuse to go fishing and explore remote places, my main goal is to help reinforce and build the constituency to preserve and protect these wild and wonderful places. Given the current state of politics in the country and multiple threats to our environment and natural resources, it’s more important than ever to take a stand and do whatever we can to protect Mother Nature. An added and very satisfying benefit has been connecting with people and making new friends around the USA and the world—readers from over 60 countries. As of Dec. 31, the blog has had over 40,000 views and 16,000 visitors, a 50% increase over 2017. Now it’s easy to figure out why most of my readers are from English-speaking countries, but who am I to ask why someone from the United Arab Emirates, Vietnam, Brazil, or Turkey would take a look. As the year comes to a close, I found it enlightening and gratifying to look back on the best, the bummers, and the blood-curdling moments of 2018 from a piscatorial perspective. Here you go…. Every serious angler has heard of the Berkley tackle company that has introduced many cutting-edge innovations to the fishing world since its creation in the 1940s. But do you know the story of the man behind the company and his quintessential Horatio Alger story? I didn’t, so when a fishing buddy, Bob Wayne, called to ask if I wanted to have lunch with the company’s founder, Berkley Bedell, I jumped at the chance. He knew of my love affair with Gulp Swimming Mullet, a lure made by Berkley, and how I doted on my Berkley Lightning Shock fishing rods. Little did Bob know, however, that my love affair with Berkley went back almost six decades. The creeks around my home base of Salida, Colorado, are barely a trickle reflecting the drought gripping Colorado. The Big Arkansas River, my home water, is running at 200 CFS, the lowest I have ever seen it since I started fishing here in the early 1990s. I can wade across it just about anywhere. Normal is about 350 CFS. But at least it has some water and is fishable. Indeed, the fishing gurus at the Ark Anglers fly shop report that the fish are actually doing better than usual because they haven’t had to fight the usual artificially high summer flows that result when upstream reservoirs dump water to support the recreational whitewater rafting industry. The Arkansas is the most heavily rafted river in the world bar none! Literally thousands of rafts careen down the river each day all summer and into the fall. Back in the 90s, the Big Ark was my favorite water. During the week, it was mostly deserted, with only a few hearty anglers scattered over almost 50 miles of good trout water. But even then, it was starting to be a battle with the recreational rafters. I was writing a conservation column for American Angler back then, and penned an article titled “Row vs. Wade” that documented the growing conflicts between the rafters, float fishermen, kayakers and the lonely angler like me in chest waders. After having boatloads of cheerful whitewater rafters plunging through honey holes I was targeting and asking me “how’s the fishing?”, flotillas of kayakers porpoising in rapids only a stone’s throw away that I knew held big rainbows, and float fishing guides letting their clients cast in pools just upstream from me on my side of the river, I suggested a river code of civility that respected the traditional wade fisherman with his limited range on the water (e.g., if you are a float fisherman and see a wade fisherman downstream, quit casting immediately and hug the bank on the other side of the stream till you are a quarter mile below him). Unfortunately, when the Ark was declared a Gold Medal Water by the State of Colorado, which was like erecting a big neon sign for every angler in Denver and Colorado to come get it, and the creation of the Arkansas Headwater Recreation Area (AHRA), a joint federal-state effort ostensibly to better manage the 148 miles of river between Leadville and Pueblo, that actually resulted in attracting more hordes of campers in RVs and every other imaginable form of shelter to primitive campgrounds along the water, things just deteriorated. The weekends are a total write-off for any sane fly angler, and even during the week it isn’t unusual now to see dozens of anglers along the river in addition to all the hoi polloi on it in watercraft (oh, did I mention the addition of SUPs stand-up paddle boarders to the mélange??). Now I know I am sounding like a curmudgeonly, grumpy old F**T, but as a result I just gave up fishing the Ark altogether during the summer and, like this year, just waited to early fall for my first outing on my beloved home water. This September I chose a stretch far enough above the AHRA campground at Rincon where float fisherman, rafters, and kayakers often use the boat ramp to launch and far enough below access points upstream that I might get lucky and not have to curse and wail when I got run over by knucklehead watercrafters—at least until later in the day. On a beautiful sunny fall day, I set out with high hopes…. It’s been a rewarding year writing my blog, and as of September 1st the number of views and visitors just surpassed all of 2017! 50,000 views and 20,000 visitors are in sight for 2018. As well as providing an admitted excuse to go fishing and explore remote places, my main goal is to help reinforce and build the constituency to preserve and protect these wild and wonderful places. An added and very satisfying benefit has been connecting with people and making new friends around the USA and the world—readers from over 50 countries. One example—a fellow from Australia is planning to come over and kayak fish with me next year!! But I think most gratifying and unexpected have been the heartwarming stories from readers like the young college student who wrote to say she had been searching for the name and location of the lake where her grandfather, who had recently passed away, took her fishing as a young girl. She wanted to revisit that special place as a tribute to him. She couldn’t find it until she happened to read my article on Island Lake in Colorado, and when she saw my photos knew that was the place. 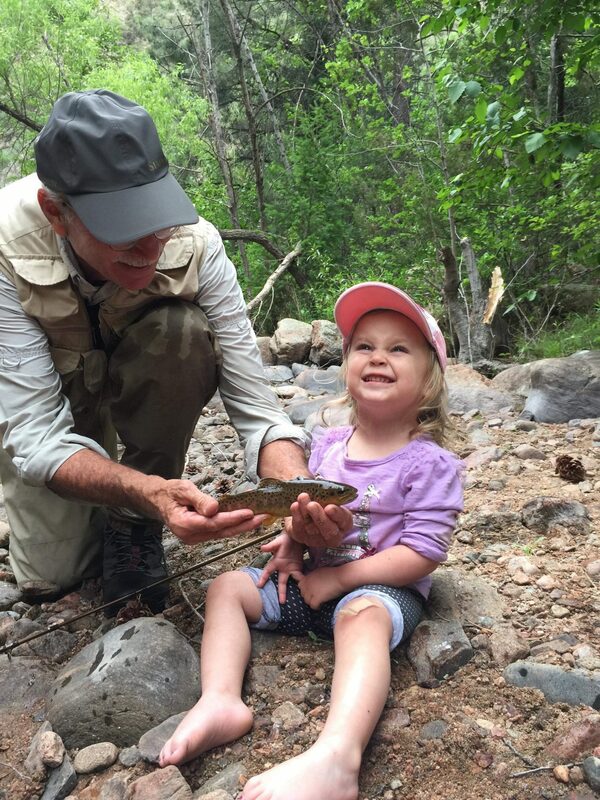 Brought tears to my eyes as I thought of the fishing trips I’ve been taking with my little granddaughter Aly and her Daddy this summer. Other readers shared happy memories of having fished, in their younger days, the creeks and lakes featured in my blog. In doing so they have enriched my life and made me determined to share more stories of special places in the coming year, knees willing and the creeks don’t rise! Let’s All Take Someone Fishing And Make Memories For Them And Us!